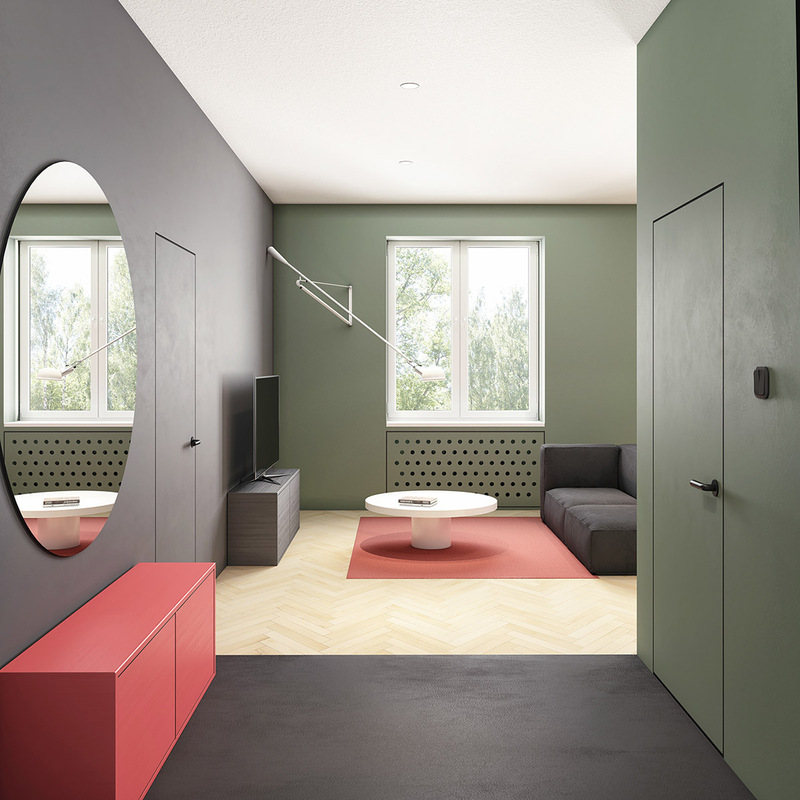 With under 75 square meters of space to work with, interior designers and architects are challenged to be creative with their usage of color, space, and storage. 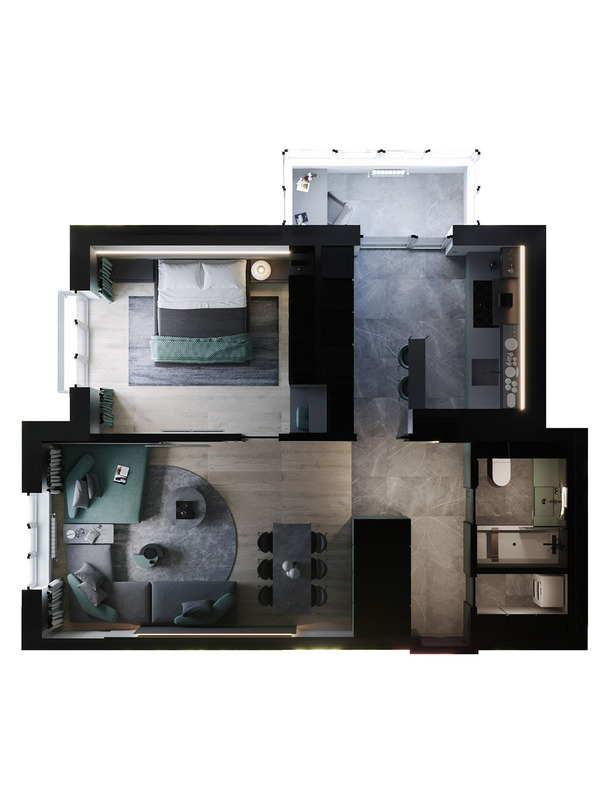 In these four apartment designs, you'll find that big design choices can truly come in small packages and that there is also power in choosing a palette to carry throughout the space. 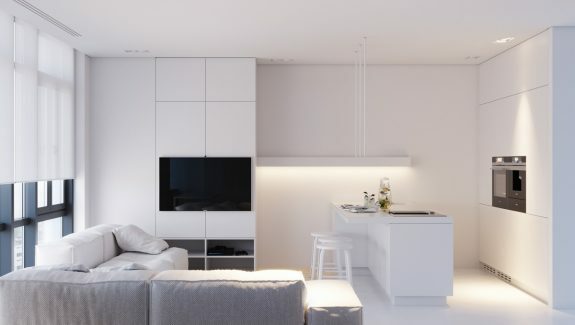 Each of these minimalist and modern apartment designs is striking in both its simplicity and its creativity. 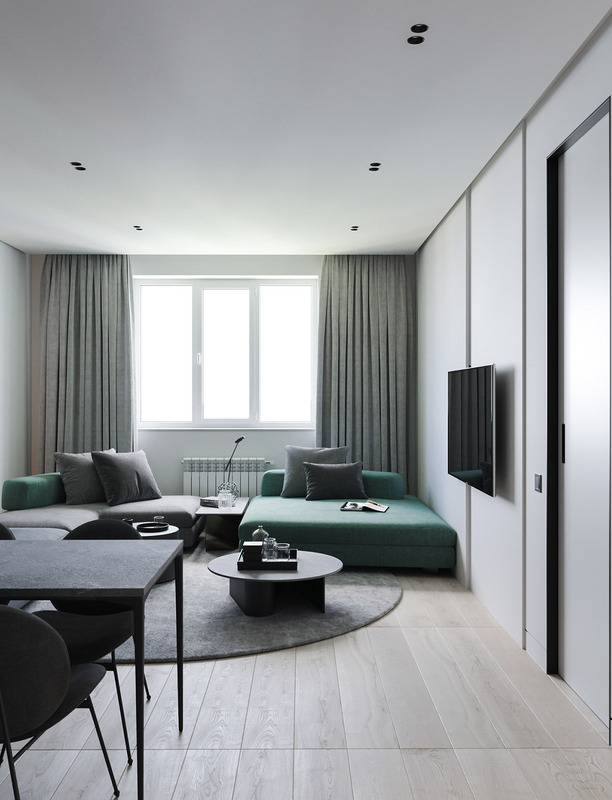 Visualized by Innoi Design , this 72 square meter apartment showcases cool tones in a way that feels fresh and modern. In the modern living room, a large circular seating area allows for versatile entertaining or relaxation. Distressed wood beams on the ceiling draw the eye upward. Recessed lighting and large windows add light and brightness. 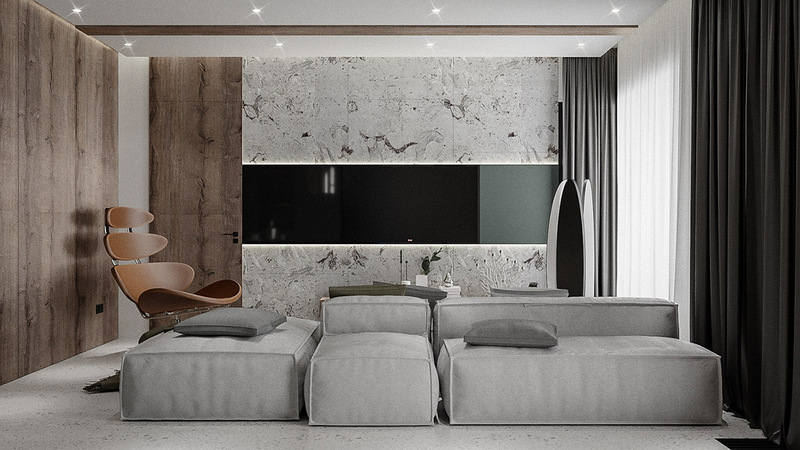 A marble accent wall adds a luxurious touch this space. 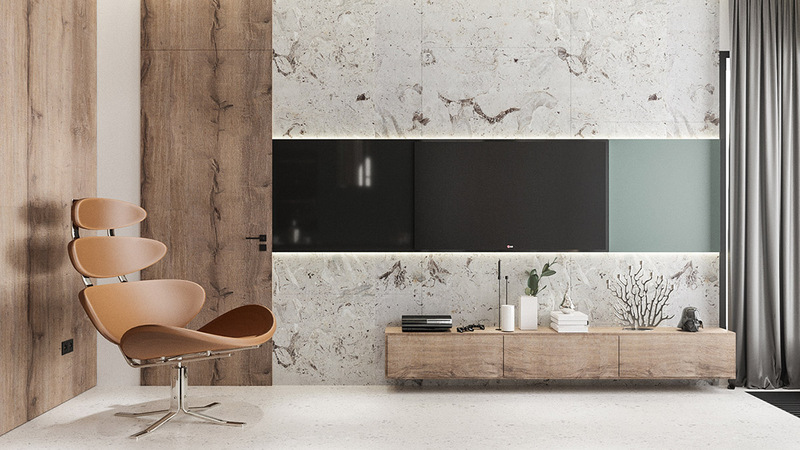 Above and below, a long media center and built-in flush mount of entertainment enables nesting of media discretely. Modern accent chairs like this one add a curved contrast to the otherwise sharp angles in the furniture and wall accents. This one is particularly striking in a warm leather. In the dining nook, modern dining chairs circle a slim table that’s centered beneath a sleek dining room pendant light. 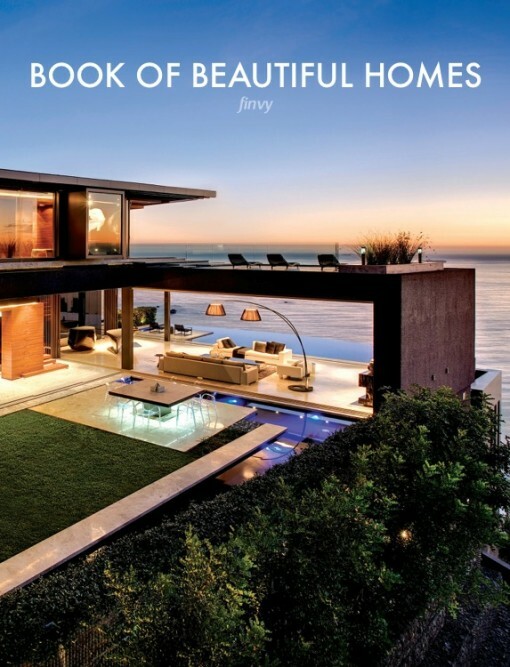 A large graphic print keeps the space from feeling stark. An open metal room divider allows a full view of the dining area while making the kitchen feel more open. 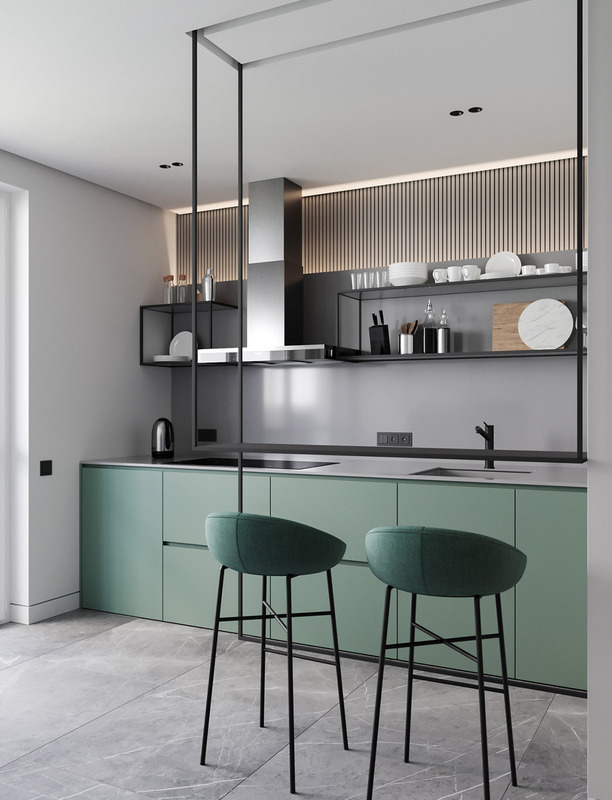 The shining metal range hood in this minimalist kitchen plays center stage when juxtaposed with the matte black and green of the cabinets and island. Flat kitchen storage cabinets on either side of the island and along the kitchen wall offer utility and style, along with a wash of color. 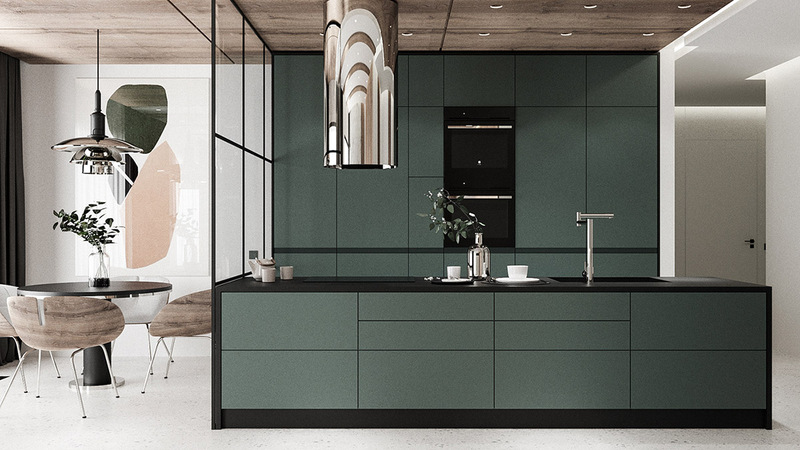 This modern green kitchen is certainly one to envy. 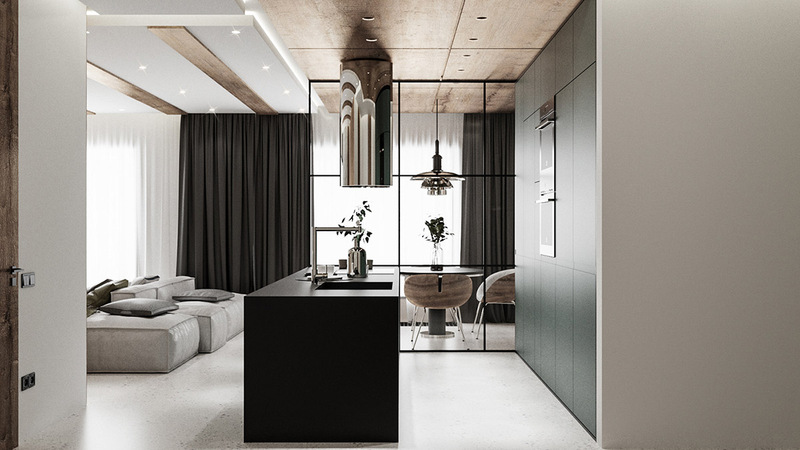 Visualized by Artem Tafy, this compact apartment in Moscow, Russia measures in at 72 square meters. Sage green and a warm salmon hue play off of each other beautifully when combined with light hardwoods in a herringbone pattern. 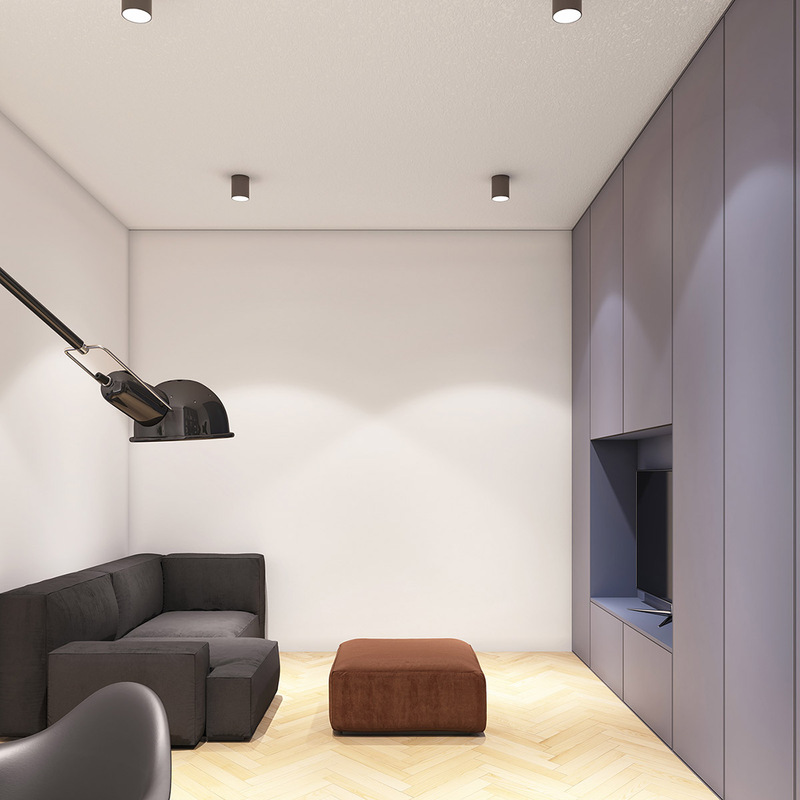 In this entryway, you’re offered a full view of the living area, including the modern swing arm wall lamp . Flos Mod 265 style lamp Original is available here. The sage and salmon palette continues into the rest of the living and dining area, which showcases a cushioned sofa at its center. Behind, a sleek dining table with a globe light above and salmon dining chairs. 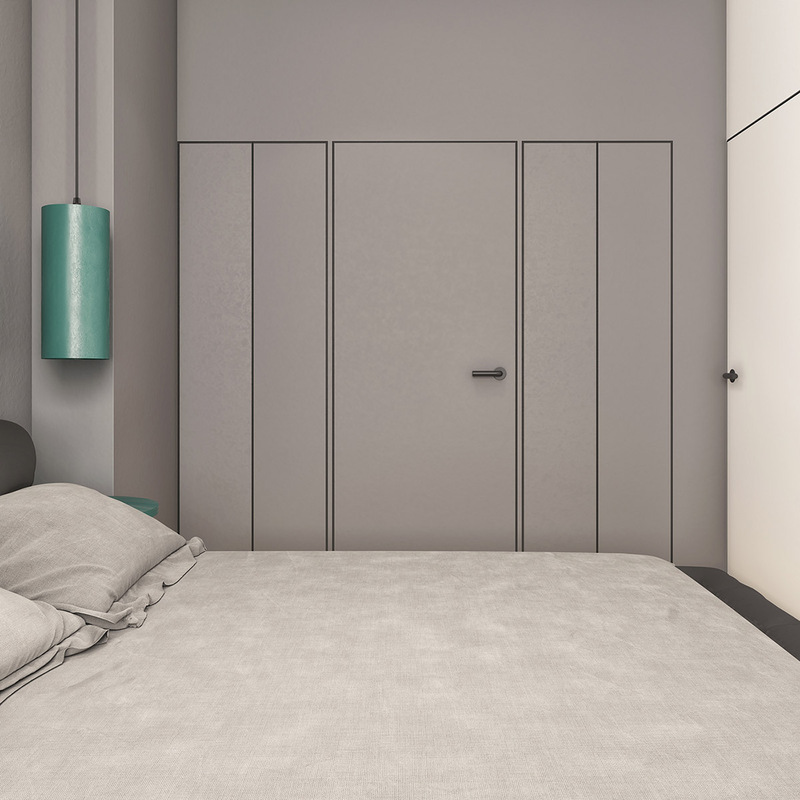 While the walls are in a matte charcoal, the space doesn’t feel too dark. The window streams in light while the pendant globe from the dining area casts a soft glow. 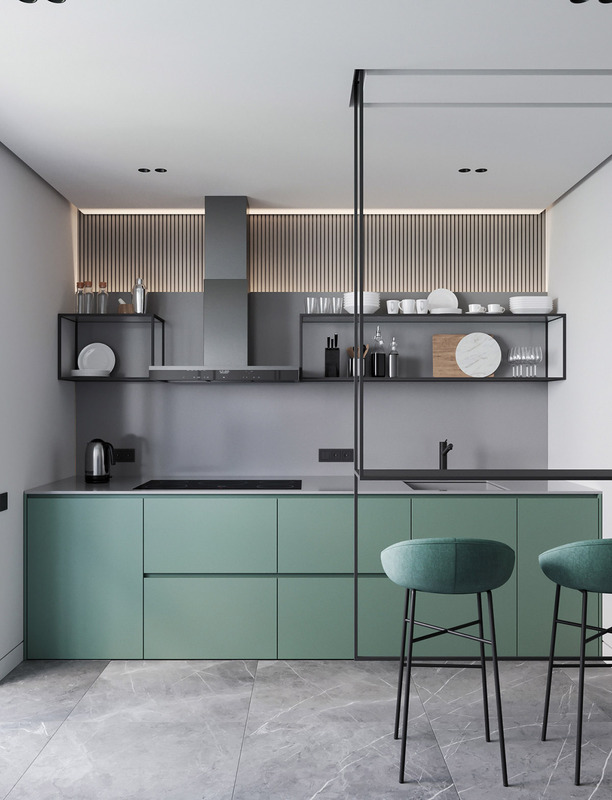 In the kitchen, which offers sage green walls and cabinets along with a stainless steel range hood and appliances, minimalism and a monochromatic palette shines. 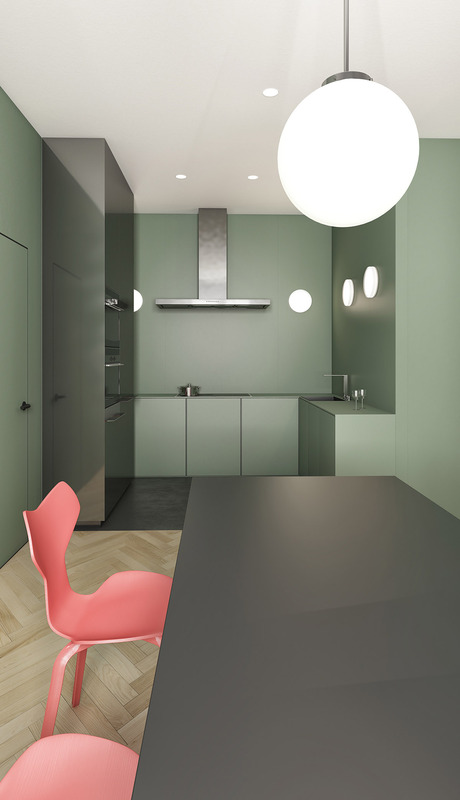 Circular wall sconces in this green kitchen make the space feel modern. 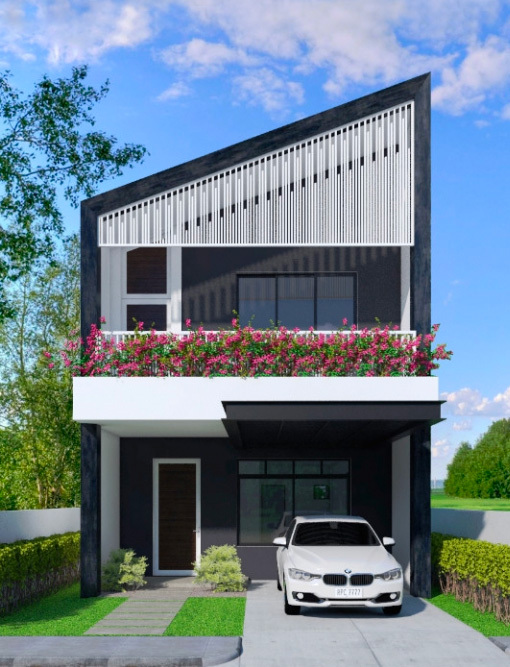 Besides the green of the indoor plants , this modern home office breaks from the other greens in the living spaces by giving way to white and a stormy blue. It feels open and airy. On the opposite wall, a built-in media center offers storage for electronics. 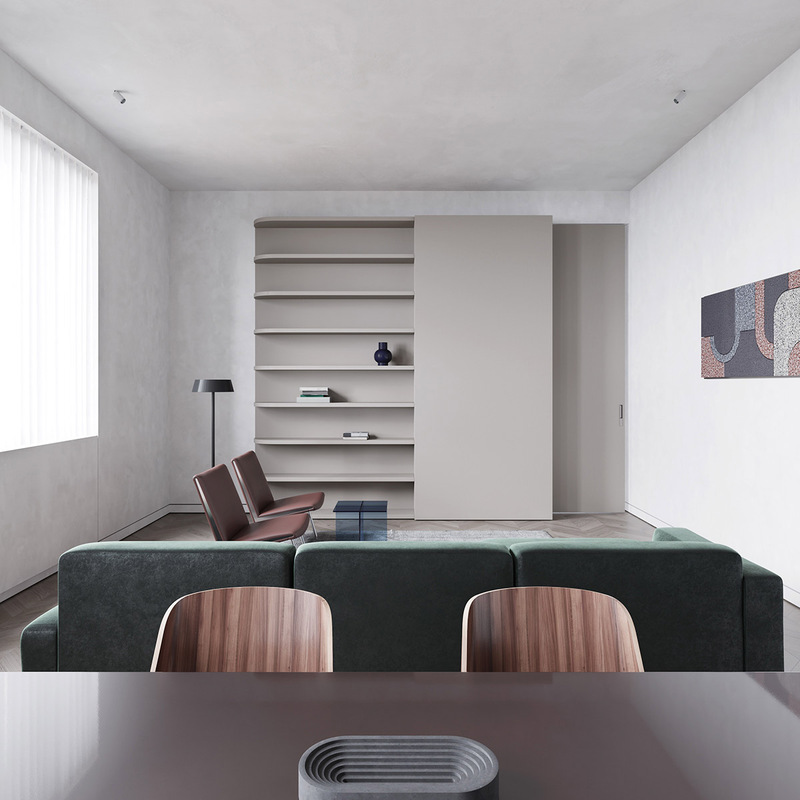 A plush brown ottoman and charcoal sofa soften the otherwise sharp lines of the space. 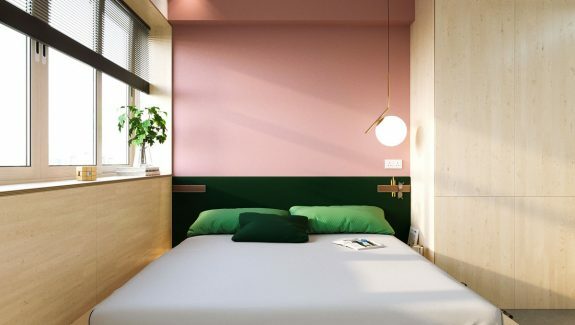 In the grey bedroom , the green pops return in the form of jade nightstands and bedroom pendant lights. A large window casts plenty of light throughout the compact, minimalist space. 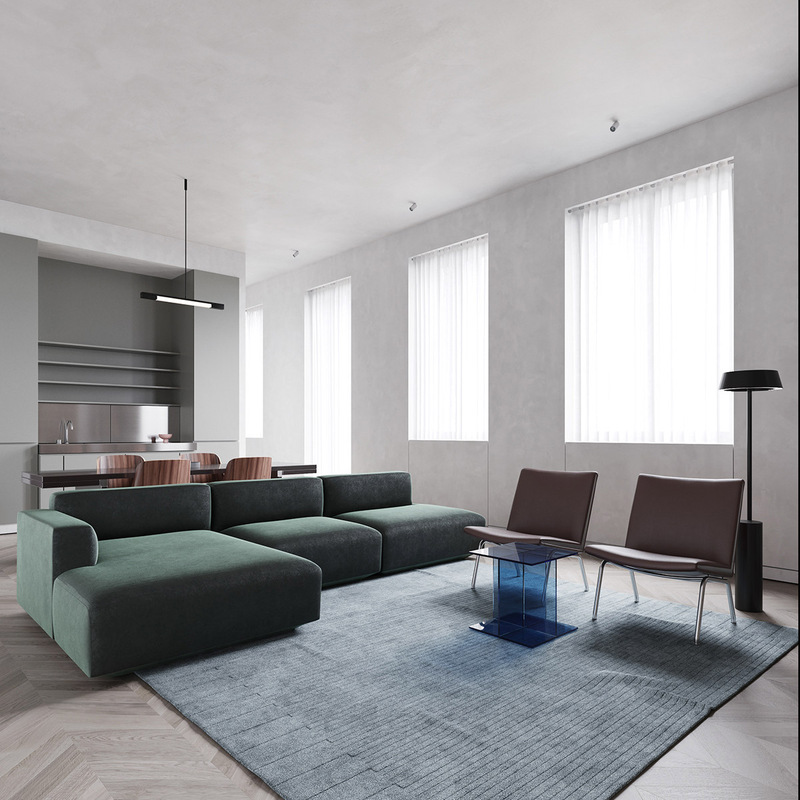 The monochromatic greys in this area of the apartment help to make the space feel bigger, in spite of the small footprint. 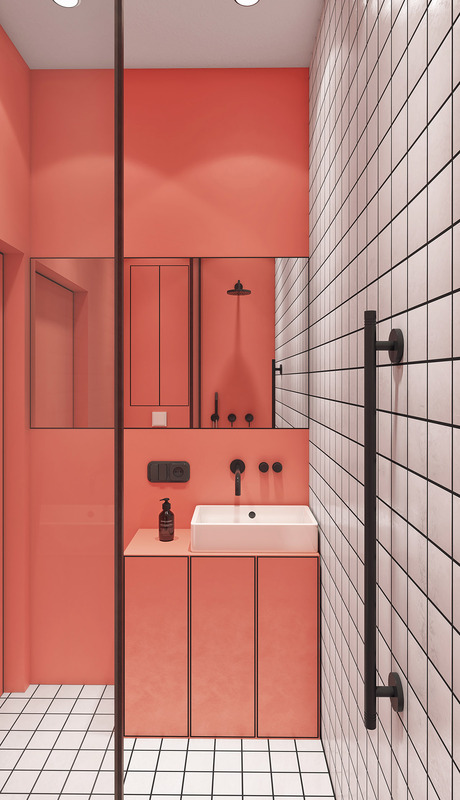 In the bathroom, it’s all about the salmon pink found in the living area. 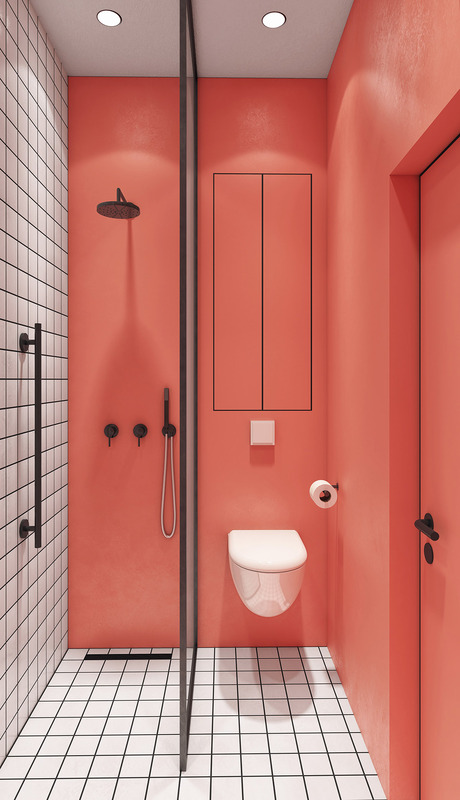 Color-rich walls make the white tile and black fixtures pop. 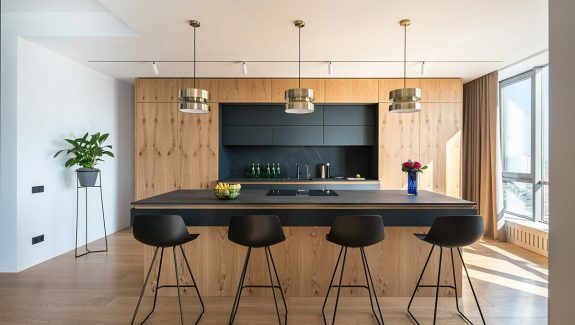 The black fixtures are simple yet striking as they flow from one side of the room to the other. 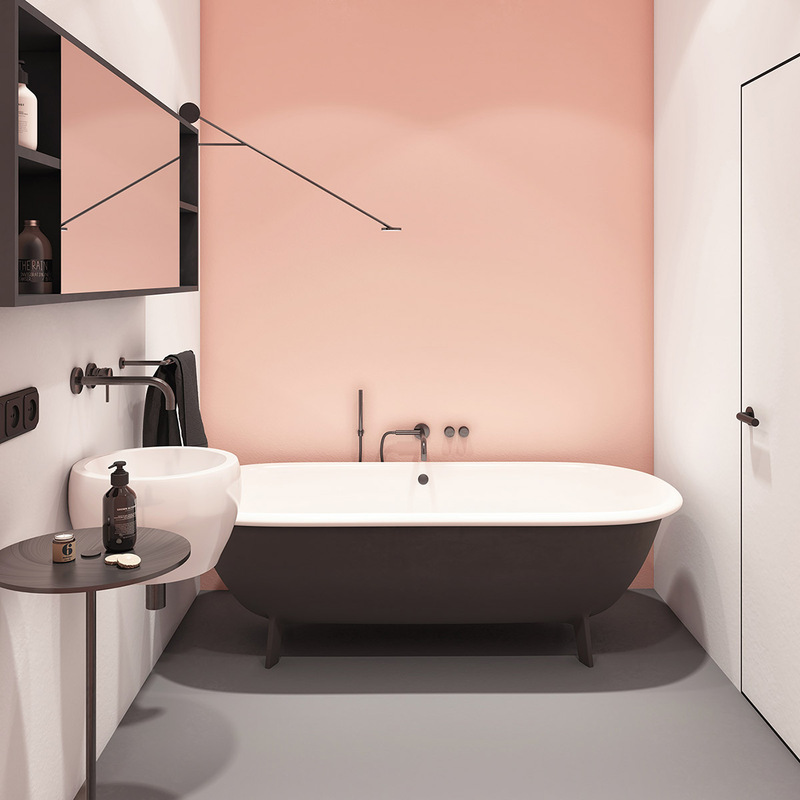 In another bathroom, a large black clawfoot tub sits against a softer pink accent wall. Black fixtures keep the space from feeling too feminine and instead, it feels fresh and bright. 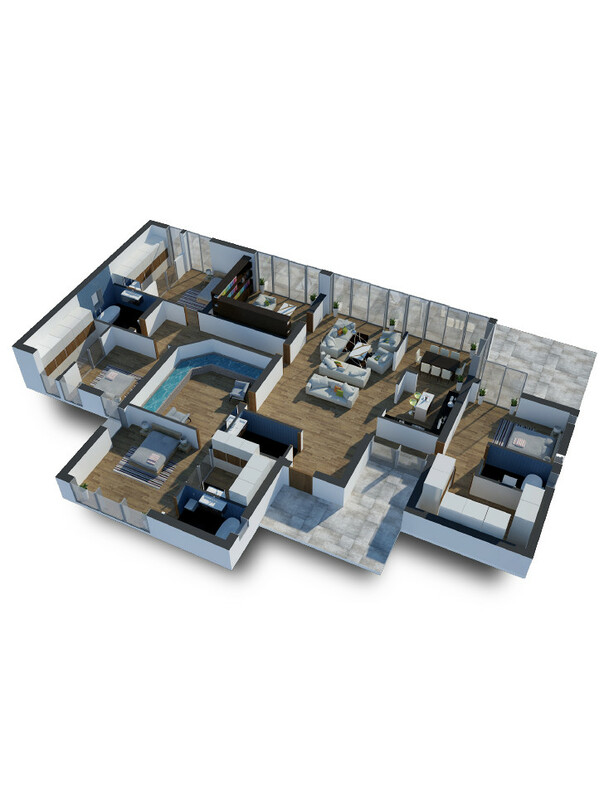 This apartment’s floor plan shows easy access for guests to keep living areas for entertaining while providing retreats for work and sleep. 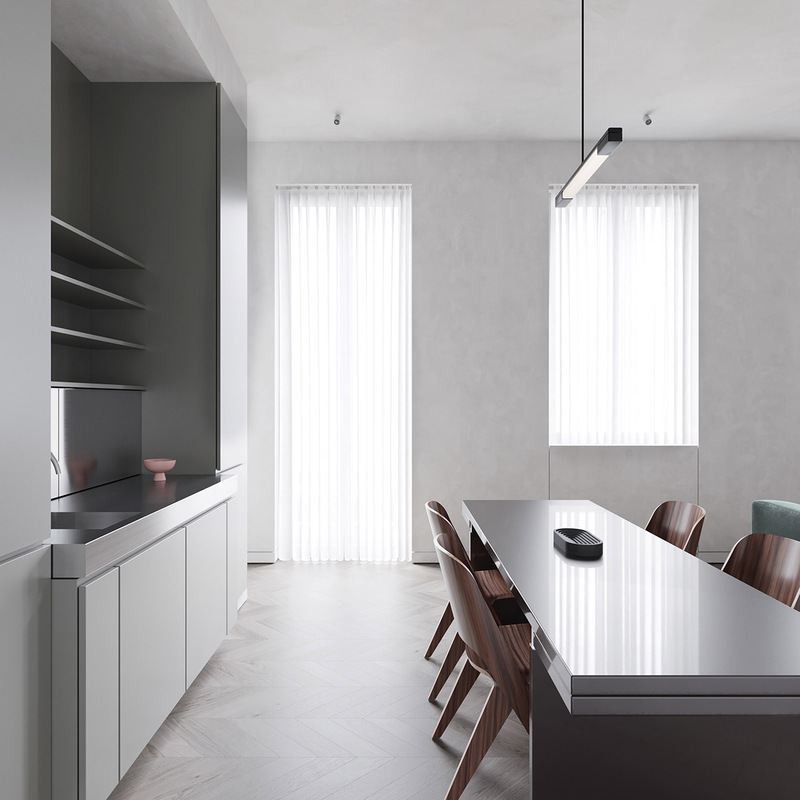 In this apartment, visualized by Ruslan Kovalchuk, slim lines appear throughout the the interior. We start in the living area, which features a unique accent wall of slim dark lines framing a large gray square. Round rugs offset the sharp angles. On the other side of this open floor plan space, a large window throws light over the cushioned seating. A TV mounts to the wall while round coffee tables provide a small bit of entertaining space. 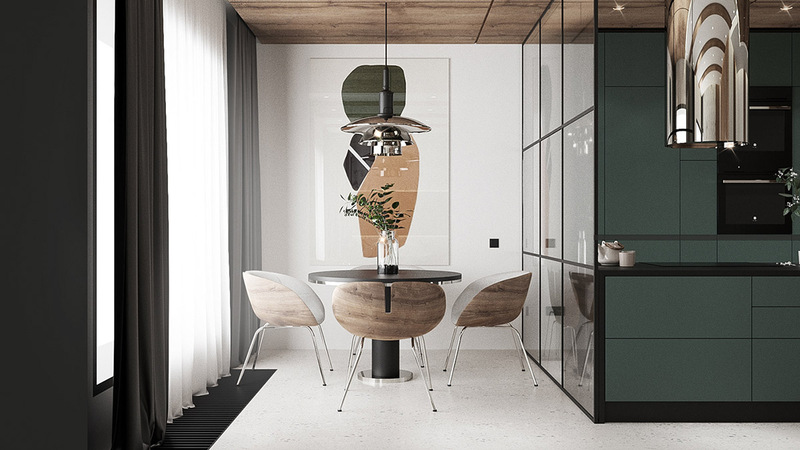 Present in the living area and the kitchen is a palette of soft greens and grays. 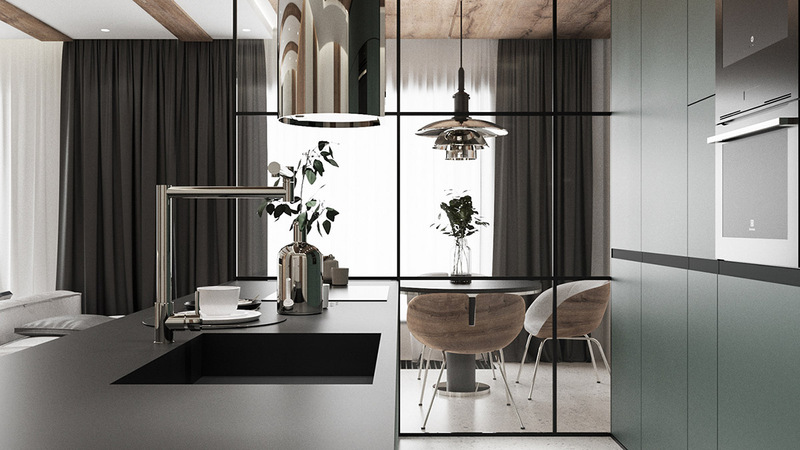 The kitchen showcases a gray marble floor, black fixtures, and open kitchen shelvingin the same matte black. Stripes with accent lighting draw the eye upward past the range hood. 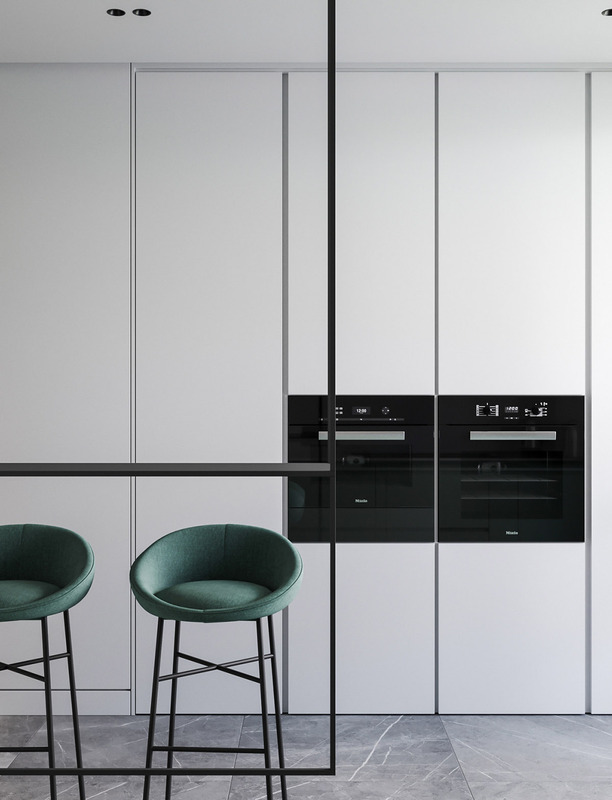 A slim dining bar is suspended from the ceiling in a matte black metal while curved kitchen bar stools sit just on the other side without crowding one wall kitchen. Appliances are built-in to the kitchen storage walls to give the compact layout even more space. 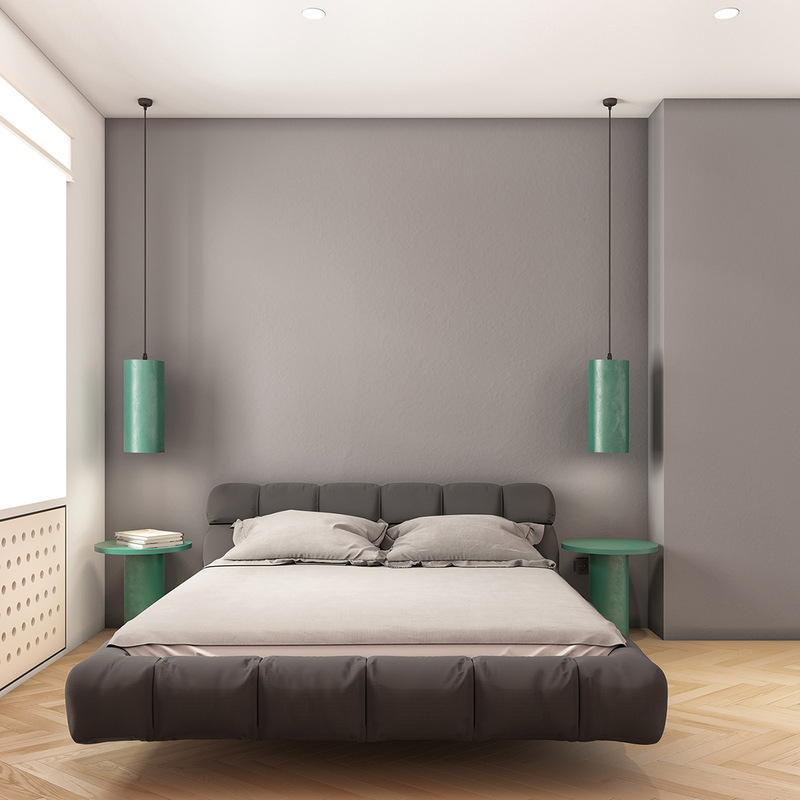 In the bedroom, a floating platform bed acts as the room’s focal point while the bedside table lamp adds a bit of warmth to the room’s overall coolness in gray, green, and white. 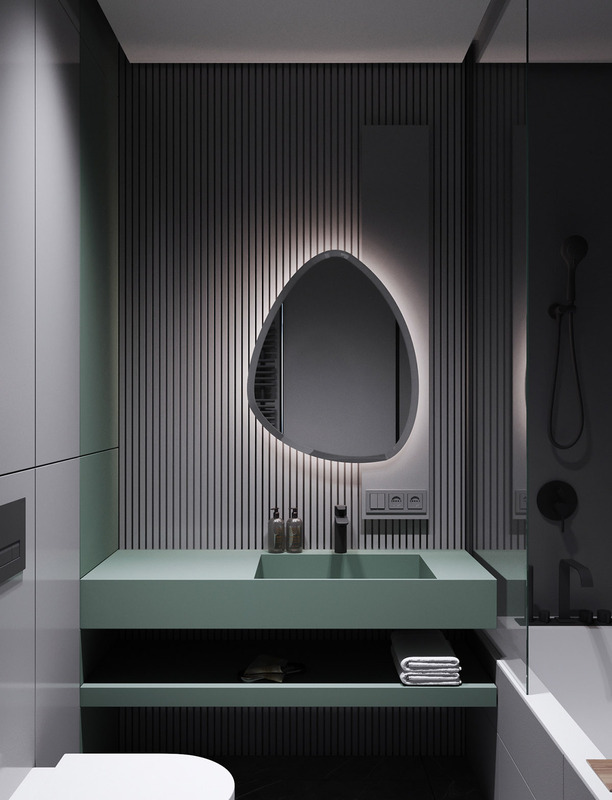 The slim lines found in the kitchen and living areas follow into the bathroom with a unique vanity mirror that casts a backlight on this interesting accent. Soft pale green and black contrast beautifully with the whiteness of the tile. 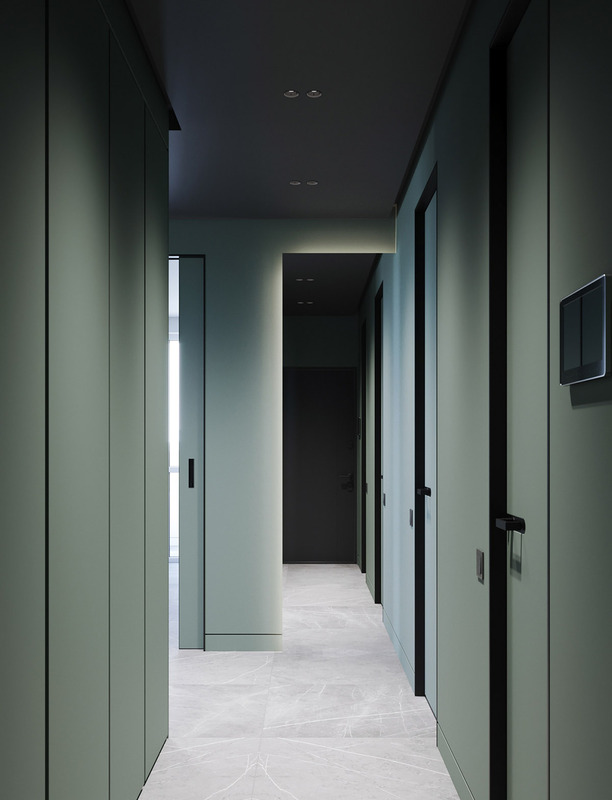 The light grey marble continues through the hallway between walls of sage green and more black fixtures. 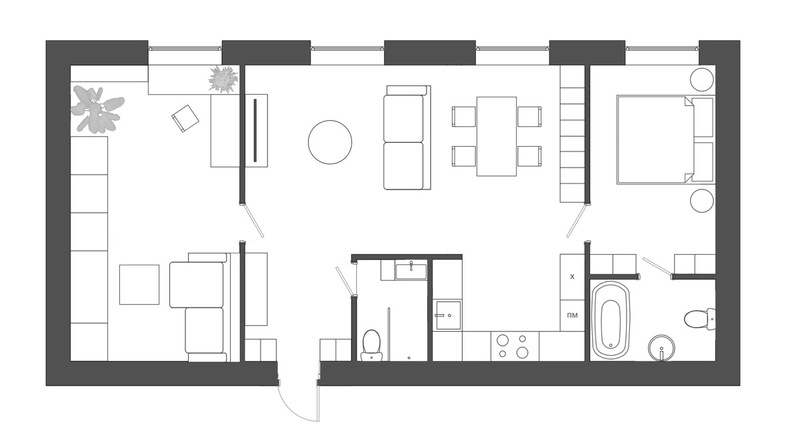 A view from the top of the apartment shows a smooth transition between living, dining, bedroom, and bathroom. 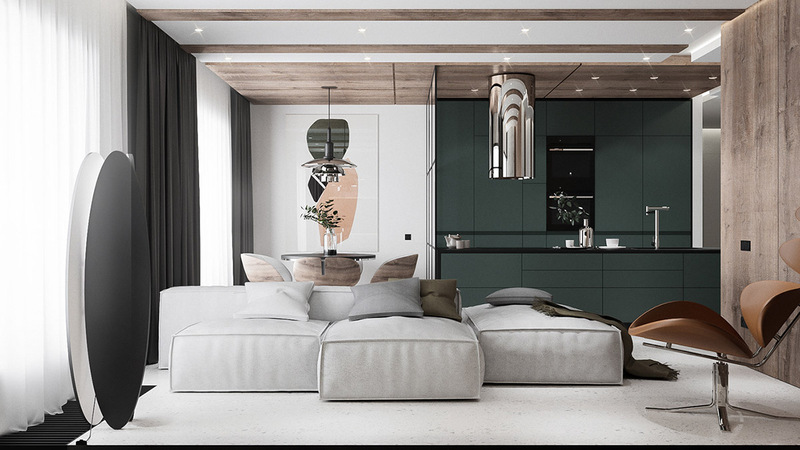 Finally, this modern apartment located in Kyiv, Ukraine and visualized by Lera Brumina, showcases 75 square meters of space used beautifully. 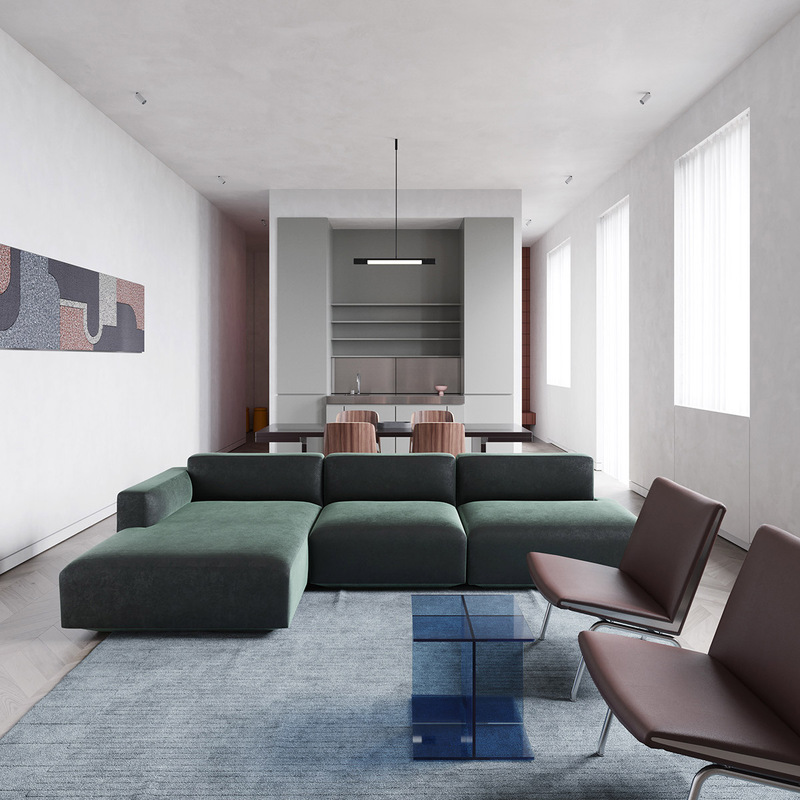 Located on the fourth floor of an early 20th century apartment building in the heart of Kyiv, the apartment has high ceilings and windows on one side. Let’s start in the minimalist living room, which offers a view of the dining area and a quiet courtyard below. 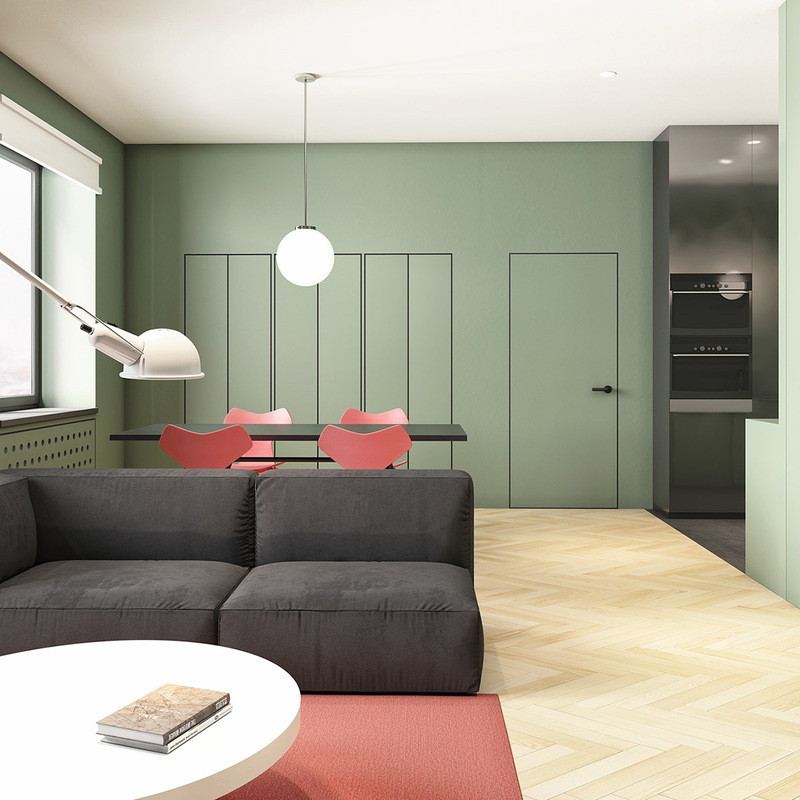 Overall, the apartment uses a neutral grey color palette with deeper color accents. 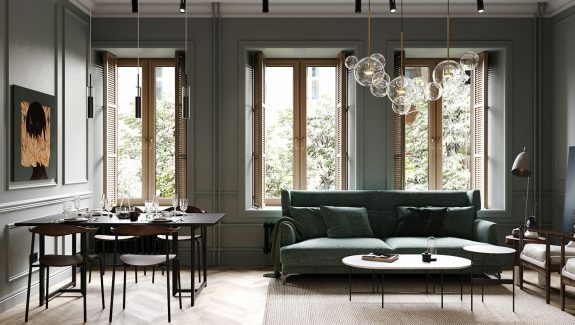 As seen here in the living area, a deep green sofa is accented by richly hued accent chairs and a translucent blue table. 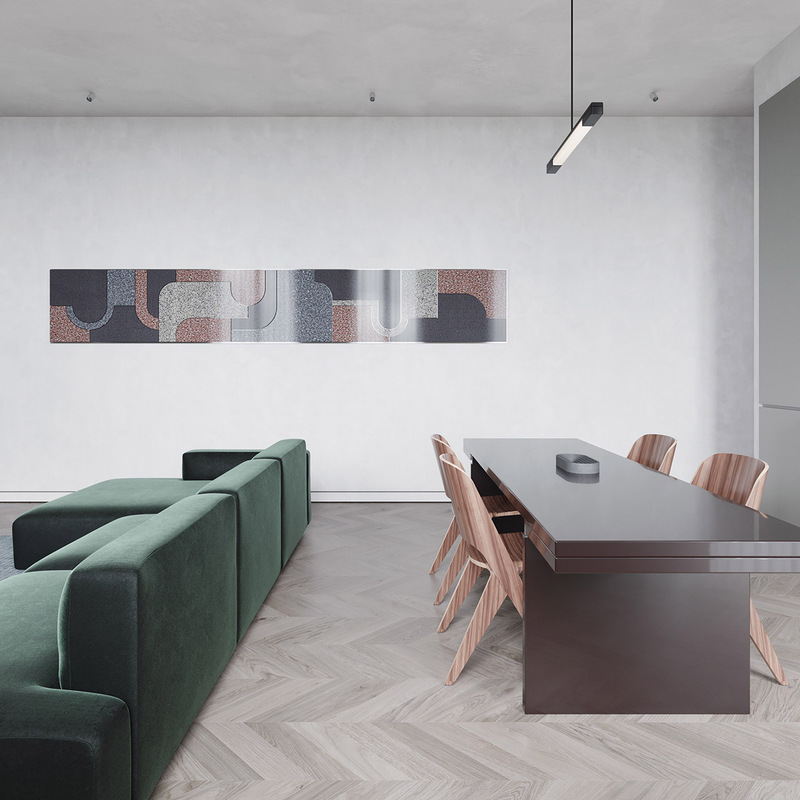 The dining table also uses deep hues in the form of a dark red, accented by wood dining chairs. 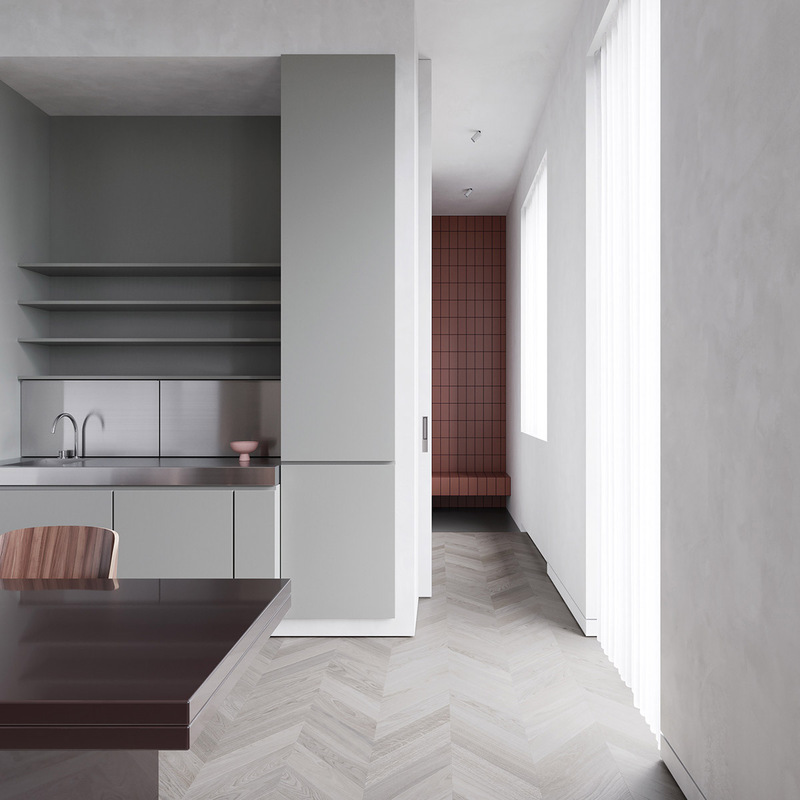 The light floors in a herringbone pattern are simple yet striking. 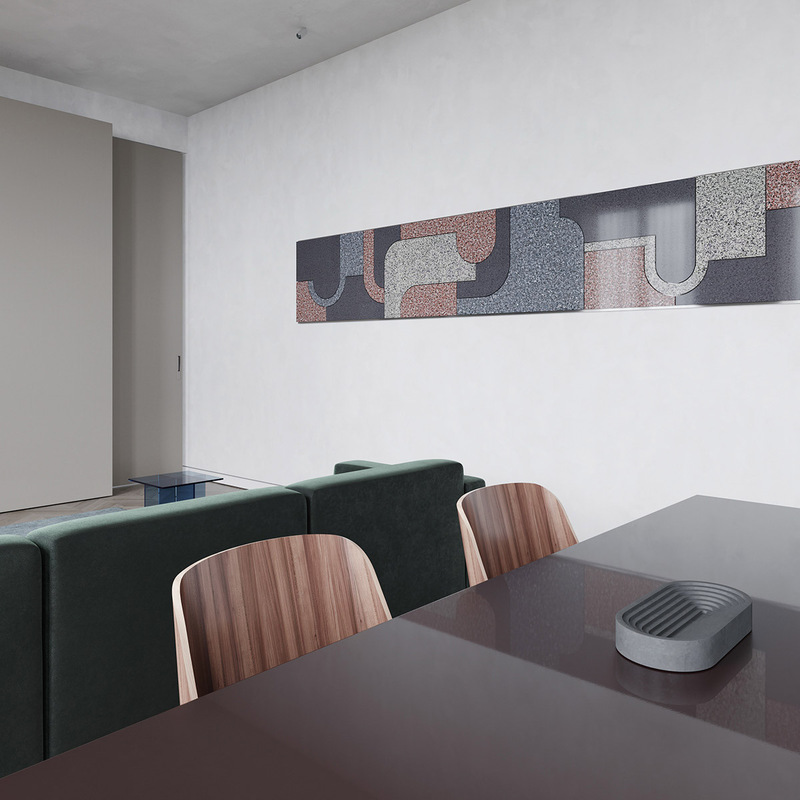 A unique piece of wall art in complimentary grays and pinks stretches in the center between living and dining areas. In a view from the dining table, a wall of minimalist open shelving shows plenty of vertical storage for books, media, or keepsakes. 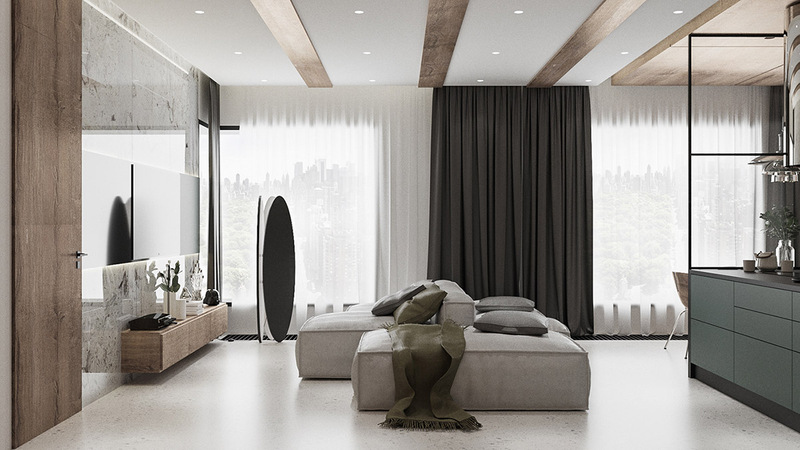 While only having windows along one wall, the high ceilings allow for light to stream into the space. The one wall kitchen continues the palette of grey but works in stainless steel in the form of fixtures, sink, counter tops, and backsplash. 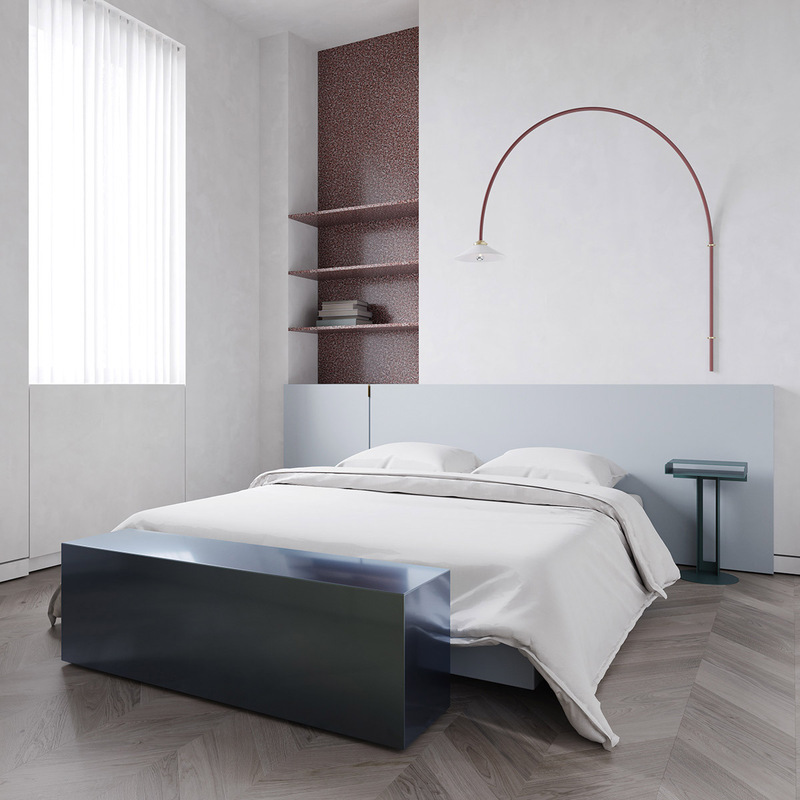 Deep red shelving along the wall behind the bed adds a bit of color in the otherwise neutral gray palette of the minimalist bedroom. 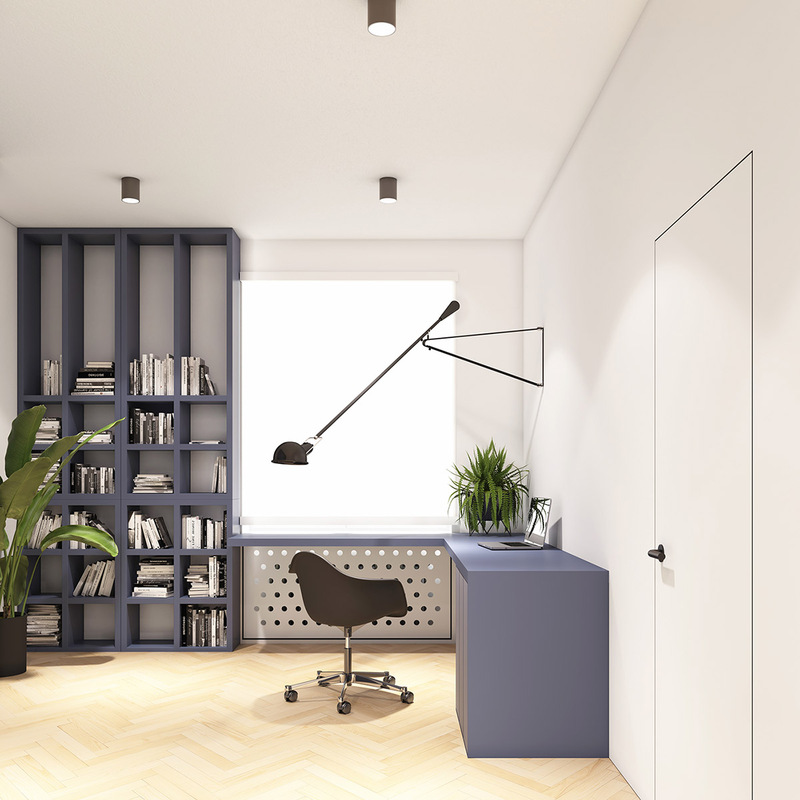 However, a slim curved pendant light adds visual interest to the space. 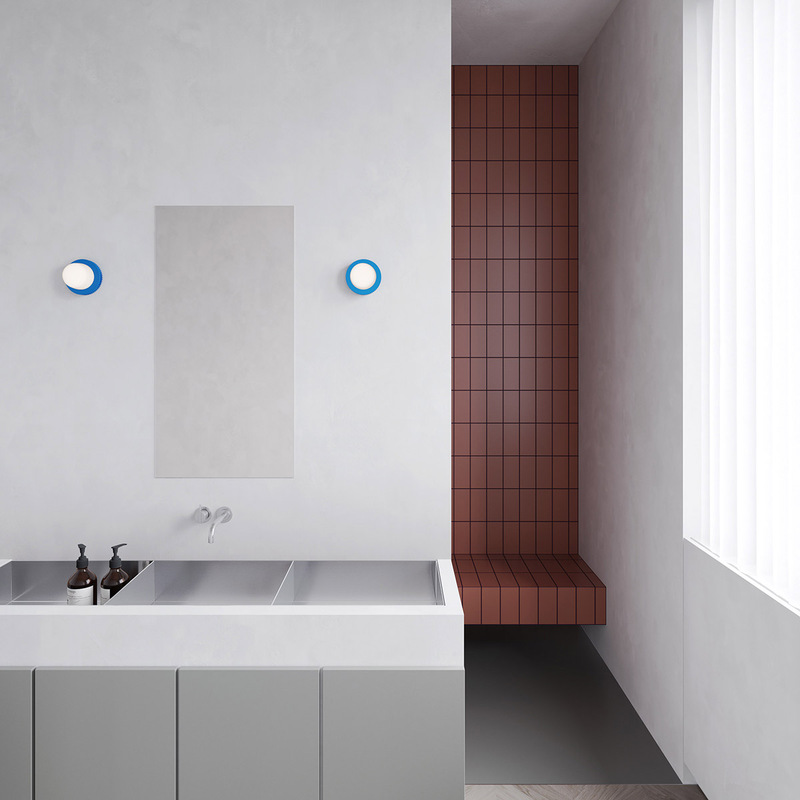 The bathroom’s deep red tile compliments the grey found in the walls and vanity. Open storage alongside the sink allows for toiletries to be stowed without adding clutter. 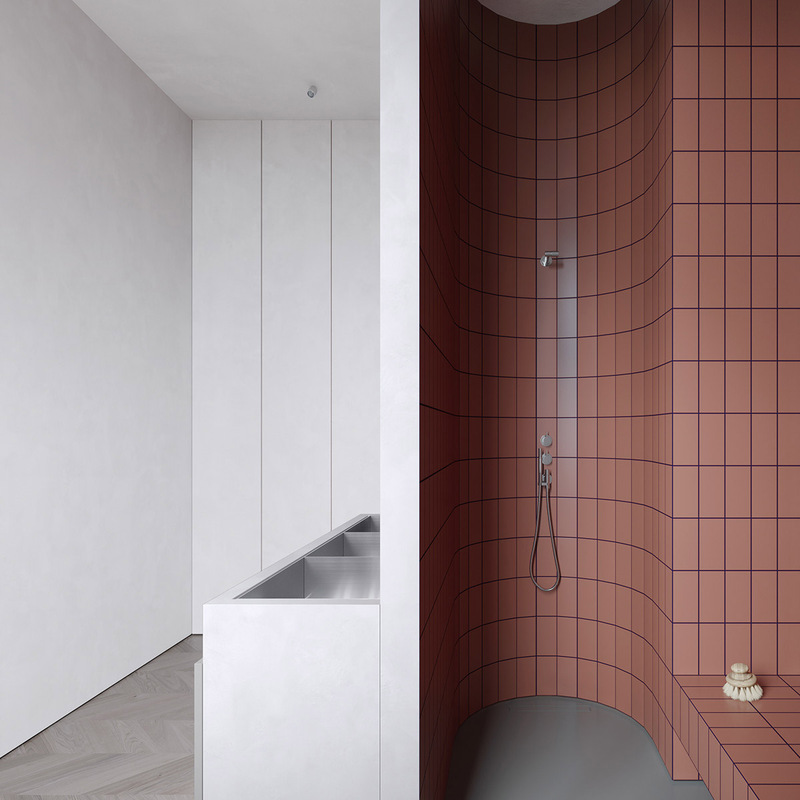 The tiled shower and walls in the bathroom are faced with original tiles, which had previously been used for the balcony walls – a unique design element that blends past and present.